Move over Tesla, there’s a new contender for the no-emissions, all-electric crown. The 2019 Jaguar I-Pace is a quirky four-door crossover SUV with a 240-mile range and the speed to go from zero to 6o mph in 4.5 seconds. A relative newcomer to the eco-friendly segment, the 2019 Jaguar I-Pace banks on the sophistication of its futuristic, luxury interior to get consumers past a base MSRP that starts at $69,500. The 2019 Jaguar I-Pace is a crossover SUV that lacks any subtlety in coming after Tesla’s all-electric vehicles. The I-Pace has many of the same features as the Tesla Model X, but endeavors to carve out a space of its own with aerodynamic body design, futuristic tech inside the cabin and a unique approach to advanced safety features. There are four model trims available: the base model I-Pace S, the I-Pace SE, I-Pace HSE and First Edition. Base models are handsomely equipped with a panoramic rooftop, keyless entry, a rearview camera and all-wheel drive. First Edition models get rich leather, a Heads-up Display, heated steering wheel, and surface response torque control. All of these features can be ordered a la carte so to speak, but a fully kitted First Edition I-Pace carries a price tag in the neighborhood of $86,895. The exterior design of the 2019 Jaguar I-Pace is a bit all over the place. It’s part wagon, part sedan, and part SUV. There is a reason though. The aerodynamic design is meant to improve driving range and set the vehicle apart from competitors. The LED lights in the front have illuminated J-shaped graphics. The front fascia channels air toward the mesh grille, through the hood scoop, and over the rounded panoramic glass roof. The front wheel wells are high, and profile lines flow down across the vehicle in a wavelike fashion. Wheel sizes come in a range from 18s to 22s and have a Jaguar emblem in the center. The door handles are visible, but they sit flush against the contoured body of the I-Pace and are only “deployed” upon command. The rear wheel wells have a squared-off top that allows air to detach cleanly from the vehicle. The roof features a built-in spoiler over the trunk lid that is also missing any overt handles. LED tail lights cross from the rear fenders to the liftgate. So how does it all work? Well, the entire floor is comprised of a 90 kWh lithium-ion battery bank. The battery bank powers two identical electric motors at the front and rear of the I-Pace. Rated at 394 horsepower and 512 pound-feet of torque, they deliver a 240-mile driving range between charges and can go from zero to 60 in 4.5 seconds. As a means of comparison, the top tier Tesla Model X boasts a 295-mile range and can go from zero to 60 mph in 2.9 seconds. The 2019 Jaguar I-Pace might lag behind on the numbers, but it still delivers an outstanding ride quality by electronically controlling the torque in adverse conditions and minimizing the lag of de-acceleration. When it comes to handling, the all-battery floor of the I-Pace helps it stick to the road with a low center of gravity. It has air springs, dual wishbone front, an integral link rear suspension. It’s a heavy vehicle though weighing in at 4,784 pounds. That’s almost the same weight as a Range Rover, but standard all-wheel drive and torque vectoring braking go a long way in minimizing the effects of all that electric power piled onto the frame. Adaptive Dynamics monitor the motion of the vehicle at 500 times a second to optimize the suspension settings in real time. You can also configure the dynamics inside the car, but the interface takes some getting used to if you’ve never logged in hours of tuning virtual vehicles on a Gran Turismo video game. Hiding behind its all-electric lead-in, the 2019 Jaguar I-Pace has hallmark luxury up its sleeve. The interior of the vehicle is quite spacious with plenty of seating space for five passengers and 51 cubic feet of cargo volume with the rear seats folded down. The interior controls and interface are futuristic and minimalist, similar to the new 2019 Porsche Cayenne E-Hybrid. A less-savvy driver might get behind the wheel of the I-Pace and wonder how to turn it on and drive it. There’s a 10-inch touchscreen up high and a smaller 5.5-inch interface zone for climate control. It also has a storage space for phones and keys. The drive selector has just four buttons – three silver buttons for drive, reverse and neutral, along with a black button for parking. The entire vehicle is only 184.3 inches long but feels more spacious inside. Sitting inside the I-Pace will feel different than other vehicles because the driver and passenger seat are farther forward due to the absence of an engine. There’s more space between the front and rear occupants providing 35 inches of legroom and additional storage space for the back bench, as well. Synthetic leather will come standard on base models, and premium trims will get authentic leather and performance seats. Wood trim is sparse, but white neon lights illuminate the interior by night like a vehicle straight from a science fiction movie. The 2019 Jaguar I-Pace connects to the driver in many different ways. Not only does it monitor your driving habits, but it can be customized to suit your driving preferences. The Remote app opens the doors, gives you updates about your battery life, and can be used to configure your personal vehicle settings. 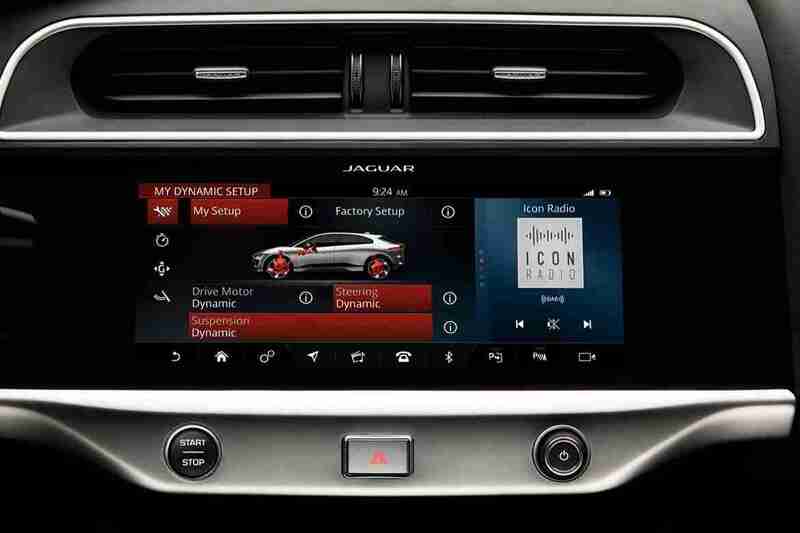 The I-Pace can start with your choice of music, for example. Over time, this system can adapt to your habits and adjust your mirrors, seat settings, and media. Navigation, primarily handled through the 10-inch touchscreen display in the center console, is also accessible through the 12.3-inch instrument cluster, which has only one traditional gauge and an overall layout that is discreet and minimal. Top of the line HSE and First Edition models benefit from a 15-speaker Meridian sound system. 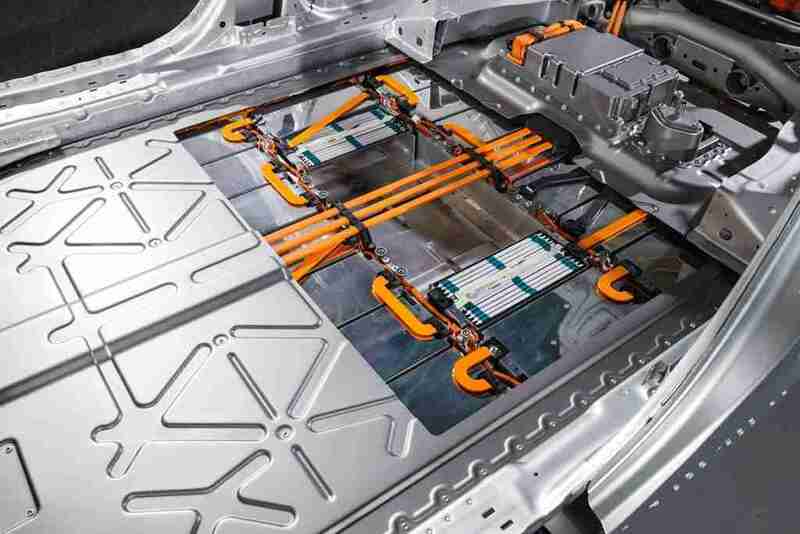 The battery bank of the 2019 I-Pace is protected by an aluminum and steel cage. All vehicles come with six airbags, a rearview camera, low-speed automatic emergency braking, and lane keeping assist. It can detect traffic signs and automatically reduce your speed if the Adaptive Speed Limiter is activated. The same system can also help regulate the cruise control. The I-Pace not only watches the road, but it’s also watching you. The driver monitoring system can alert you if it feels that you’re getting drowsy and need to take a break from driving. 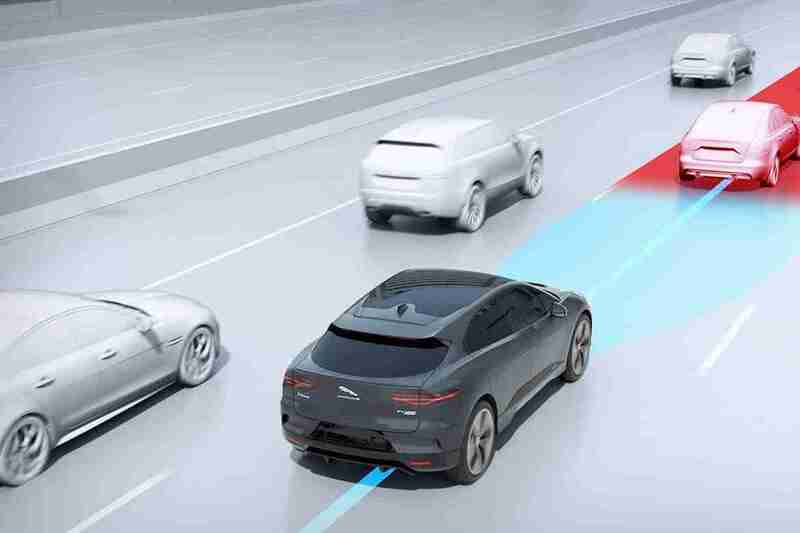 The most sought-after safety features for the 2019 I-Pace get bundled into packages. Most drivers will want all of these features, so it’s a tick in the loss column for Jaguar to separate them in pricey package bundles. The Park Package gives you sensors that aid in getting into and out of tight parking space. This package can also detect pedestrians and semi-automatically park the vehicle. You just need to adjust the speed. The next bundle is called the Drive Package and it features high-speed automatic braking, blind spot monitoring, and adaptive cruise control. The Driver Assist Package barely touches the height of semi-autonomous driving. It comes with adaptive cruise control that can actually steer around vehicles, four onboard cameras, and everything from the Drive Package. An interesting safety feature of the I-Pace is the audible sound that it emits. Because the electric motor system runs whisper quiet, the I-Pace emits a futuristic hum to alert you that it’s been activated and also to warn other drivers and pedestrians of your presence. For now, the 2019 Jaguar I-Pace is leading the way in all-electric contenders to the Tesla throne. 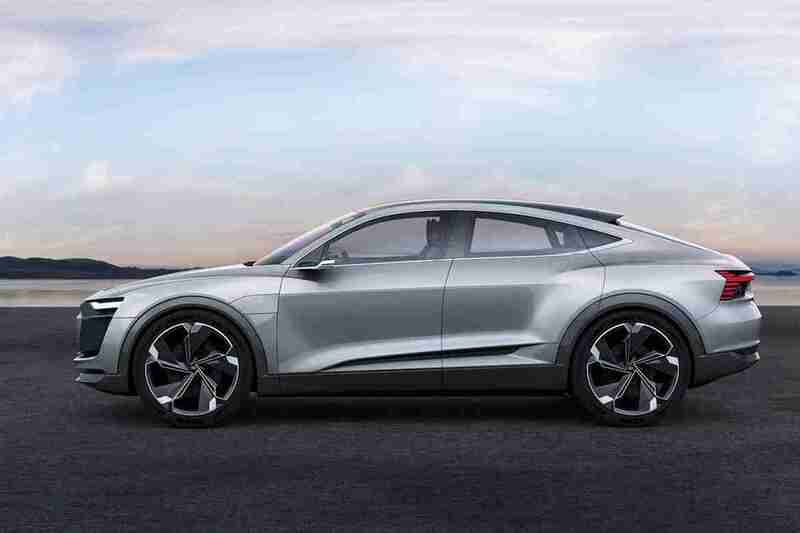 However, soon the field will get crowded when the Audi Q6 E-Tron, Porsche Taycan, and other big automakers start releasing their luxury all-electric crossovers. Jaguar can only hope that the impression left by the 2019 I-Pace is a lasting one. The Jaguar I-Pace is one of the most anticipated vehicles of 2019 because it delivers a taste of the future before it arrives. The exterior style of the I-Pace is polarizing. People will either love it or hate it. The interior is strikingly minimalist and could use a bit more refinement to live up to the expectations of a Jaguar. The I-Pace has the handling of a Porsche with all-wheel drive and the acceleration of a Tesla Model X. The all-electric range is impressive, and the driving dynamics can mimic gasoline cars or provide a genuinely all-electric zippy ride. The vehicle’s design implies inherent safety, but the absence of fully autonomous driving in 2019 is somewhat of a let-down. However, the advanced safety features included on the I-Pace are quite comprehensive, even though they come at pricey premiums. The I-Pace is a new vehicle that will only get better as later generations are updated, and competitors creep onto the stage. Until then, the 2019 Jaguar I-Pace is one of the best alternatives to the sheer market dominance of Tesla.